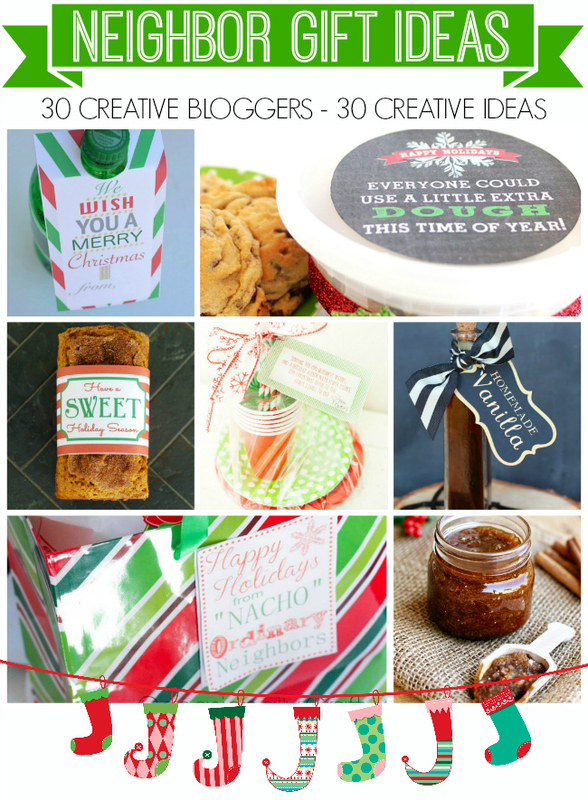 It’s time to start thinking about homemade holiday gift ideas again, and today we’re teaming up with 30 of your favorite bloggers to offer you some creative neighbor gifts! 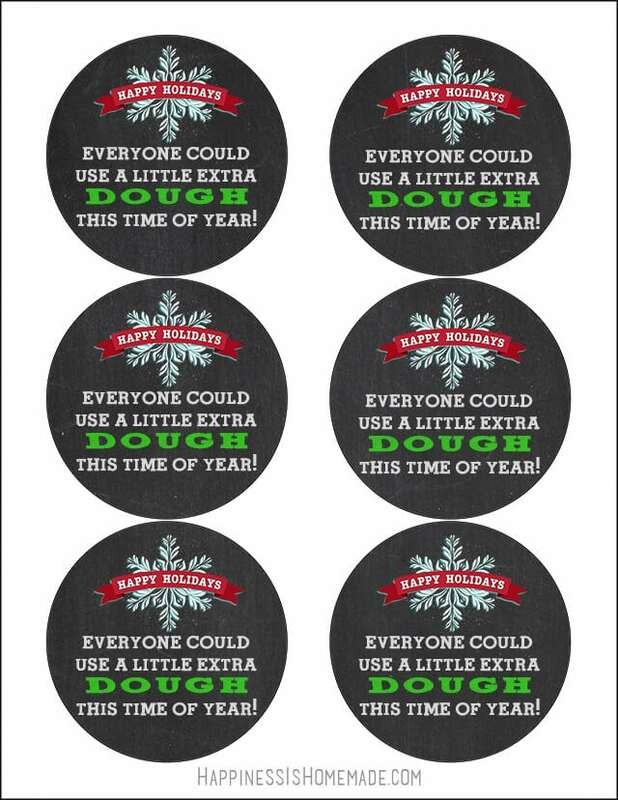 This year we’re sharing a little extra holiday “dough” with our neighbors with the help of these cute printable labels! Our neighbors entertain a lot around the holidays, so I decided to gift them with some fresh cookie dough that they can quickly pop in the oven when they have guests over. 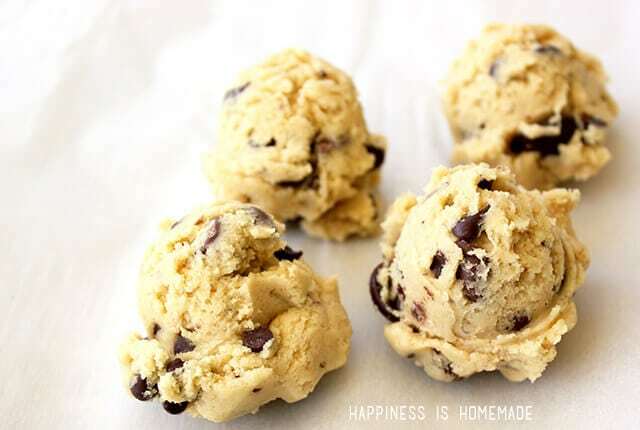 Nothing beats a warm chocolate chip cookie…except for one that you didn’t have to mix up yourself! I started with a double batch of our World’s Best Chocolate Chip Cookie Dough and a stack of 16 oz. plastic deli containers. 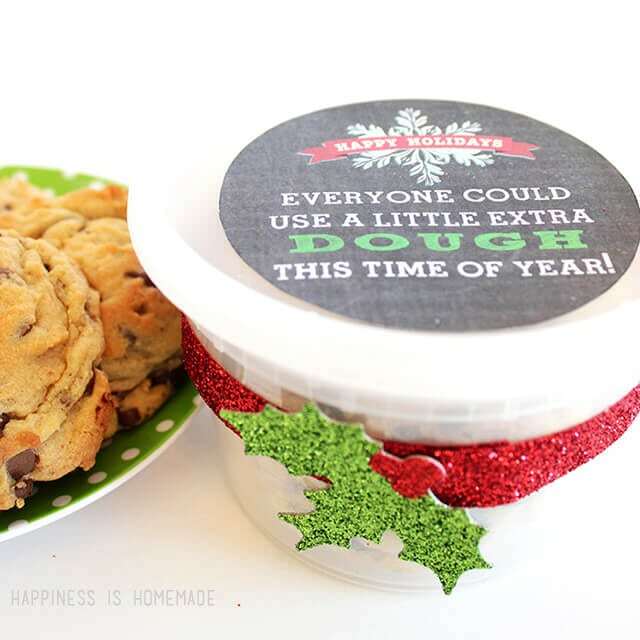 I found that a double batch of cookie dough was enough for 5 gifts, but you could probably stretch it to 6 or 7 if you don’t pack the containers completely full. I created a fun printable that says, “Everyone Could Use a Little Extra DOUGH This Time of Year!” and printed it out on to 3 1/3″ round labels. 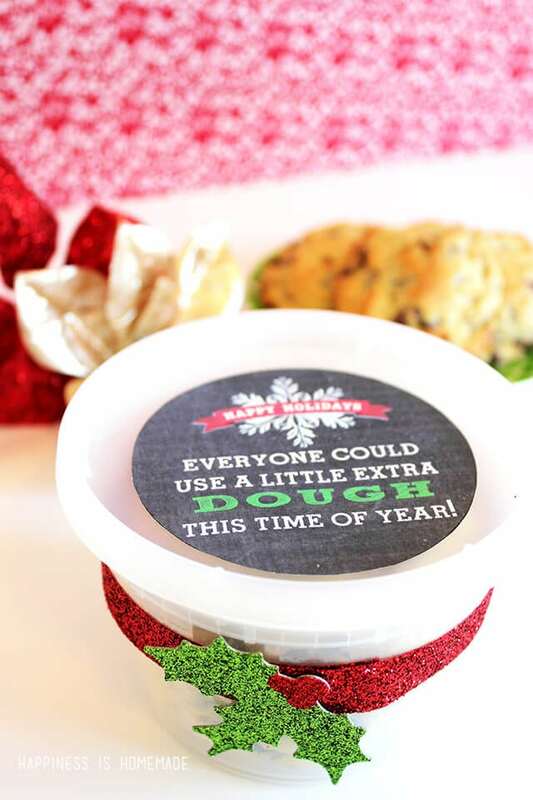 I finished off the gifts by adding a few glittery dollar store embellishments to the containers – super cute (and totally inexpensive!)! 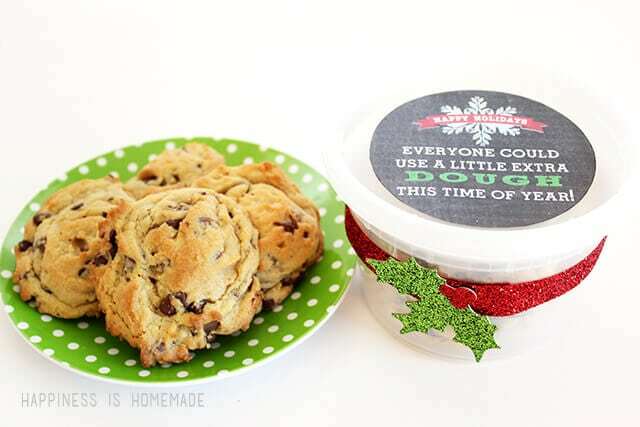 I’m not the only one with neighbor gifts on my mind though, so be sure to check out all the awesome ideas below! Just click on the links to visit the other blogs for more details. I love this printable. 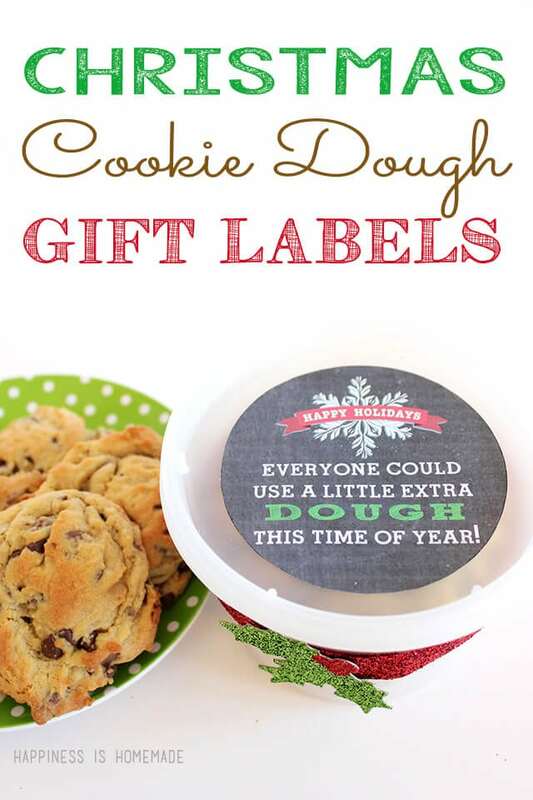 We had neighbors that did cookie dough for neighbor gifts every year. It was such a fun tradition. Hi, Heidi. Love this great idea. I wanted to let you know that the link to your post is broken at the bottom of the post where it lists everyone’s project. I found yours by googling your blog name. Thanks for the cute printables. I love it Heidi! I did something similar for Fathers Day last year. 🙂 I want one of those cookies right now too! So cute! I am seriously considering this if I don’t do more wrapping paper. This is absolutely brilliant Heidi, love it!